"It's the hard that makes it great!" It was hard to find enough stars to give this race. Especially in the ELEVATION category! The Blue Ridge Marathon is epic in the true sense of the word. It's tough as nails but that is what makes it so appealing! The Expo: The Expo for the Blue Ridge Marathon was held at the Patrick Henry Hotel, which is right across the street from the Start/Finish Line. This made logistics a breeze in terms of selecting a hotel and finding my way around. 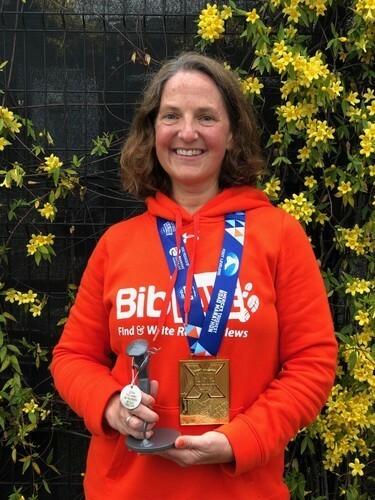 Unlike big race expos, this one seemed less about shopping (although there were still plenty of things to try/purchase) and more about getting to know other runners. Runners get a free drink at the bar during the expo so it seemed like most folks picked up their packets, browsed through the merchandise and then congregated at the bar. It made for a cool, fun vibe. Events: The Blue Ridge Marathon isn’t just a one-off race. It’s a whole weekend of events that include a shakeout run, a pre-race concert, a day of races (10K, Half, and Full), and a Slow K on Sunday morning that stressed an easy-going pace (you were encouraged to walk and talk with your coffee and donuts)! THIS WAS BY FAR MY FAVORITE PART OF THIS ENTIRE RACE WEEKEND!! The Course: The course is hard. There is no other way to say it. But in the immortal words of Tom Hanks (League of Their Own,) "It's the hard that makes it great." Train for the hills...both the ups and the downs...and you will have a much better day than if you try to wing it. This course is not for the faint of heart. But the views are absolutely stunning and (almost) worth every foot of elevation change it takes to get to them. The Support: So, so good. Volunteers were everywhere. Water stations were aplenty. Spectators and community members came out in droves to offer water, jello shots, "moo-mosas," and one spot even had a kissing booth! The Amenities: Swag included a beautiful tee (made from recycled materials) and a medal for the marathon and a fantastic coffee mug for Sunday's Slow K. LOVE! Bottom Line: If you love a challenge, you will freakin' love this race. 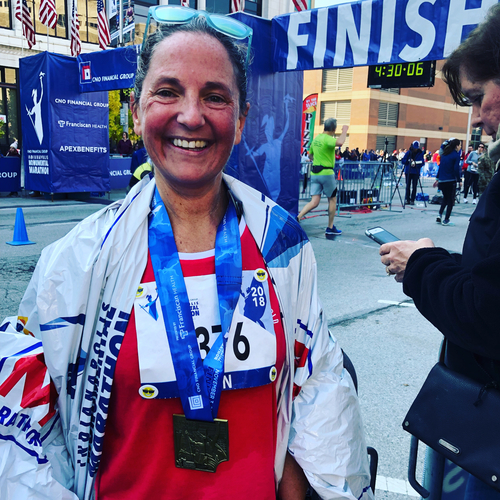 "Primo Race Organization Makes For a Fast, Fun Race"
My key takeaway from this past weekend's Chevron Houston Marathon was that this race was so well organized and supported, it made every single aspect of the event fun and fast. What more could a runner ask for?? The race expo was a great size, perfect for picking up last minute supplies (like the gels I didn't want to bring on the plane,) and for trying out the latest and greatest new running gear. On race morning, parking was plentiful and we were able to wait indoors until about 15 minutes before our corral closed. A nice perk on a 30 degree morning! Aid stations stocked with water, Gatorade Endurance and gels were plentiful along the course. As were the port-a-cans. I passed banks of potties with no line at several spots over the 26.2 miles. I was also super impressed with how many Houstonians came out to cheer on runners, especially considering how cold it was on race day. If you like cheering spectators, and course entertainment like bands, cheer squads, and even belly dancers, you will love this race. Side note: A friend I was with needed some medical attention after the race and the med team was there in a jiffy. I merely had to look around and put my hand in the air and a volunteer came running with a wheelchair. Now that's amazing race preparation! I got into town at 7pm on Sat night (due to some construction on my route) but as the expo was open until 8pm, I had no problem picking up my packet and even doing some shopping. I stayed at the Sheraton which was less than 1/2 mile from the Expo and the start/finish lines as well as plenty of places to eat and get some morning tea/coffee. Race morning weather was cool (mid-30s) and clear, warming up to the upper 40s - low 50s by noon. Perfect race temps. No wind. Freakin' beautiful. Seriously! I had no idea that Indianapolis was such a pretty city but it truly is. The course took us through lovely neighborhoods, a park with gorgeous fall foliage, and alongside a river (the White River?) with stunning views along the way. The crowd support was also fantastic. It was not constant - there were definitely places along the course that were quiet but for the most part there were tons of places along the course where people were out and about cheering and offering support. Volunteers were plentiful everywhere from the Expo (where they are standing in key locations offering to take pics and answer questions) to the finish line (where they are literally walking through the crowd of finishers asking what they need and what questions they might have. The race started on time and the course was well marked. There were plenty of aid stations although I did notice that you did not know ahead of time where they would be. The map just said that there were 19 aid stations along the course but it did not say where. That was fine with me and I never felt like they were too spread out, but I know some people like to plan ahead with their water, gel, porta potty stops. 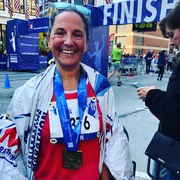 All in all I had a great time at the Indy Monumental Marathon and I would highly recommend it to anyone looking for a PR, a BQ, or just a beautiful fall race. 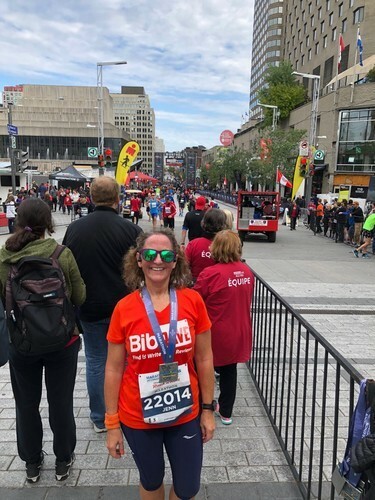 "2018 Rock 'n' Roll Montreal Marathon"
When I initially signed up to run this race, I did not realize that I would also be running a Ragnar race in the Adirondacks immediately before. Fortunately, the easy logistics in Montreal and of RnR races in general made it a breeze for me to take on this race combo. EXPO: Sadly, I did not get a chance to experience the race expo because it closed at 5pm on Sat and with travel from Lake Placid, I was afraid I would not make it. Fortunately, I had a friend running the race who was easily able to pick up my bib and race packet. That saved me lots of time and hassle. My friend did say that she was a little confused about where to park for the expo but she eventually found her way without too much trouble. LOGISTICS: I don't always stay at the host hotel for races but I did for Montreal and it turned out to be an excellent choice. The host hotel was the Hyatt Regency and it could not have been more convenient. Bag drop was actually on the second floor of the hotel and the start line was just a few steps from the door. Literally. It was a little cool and breezy and I didn't want to stand around waiting any longer than I had to in the morning yet I walked out of the hotel at 7:22 and walked in to my corral in plenty of time for the 7:30 start. That was unreal! COURSE: I don't know what the course was like in previous years but I do know that it was completely redesigned this year and it was absolutely stunning. I really felt like I got a beautiful 26(.2) mile tour of the best that Montreal had to offer. From the Montreal Botanical Gardens to the beautiful townhouses and bridges around town, I soaked up the scenery on this course. And the pleasant cool temps meant there were lots of spectators out on the course to cheer us on. I didn't always know what they were saying but I appreciated their words and signs nonetheless! SWAG and AID STATIONS: Race swag included a short-sleeved tech tee and a cool RnR medal. I'll admit that I was a little bummed that the half-marathon included Montreal's signature fleur-de-lis while the marathon medal was a little more generic. Aid stations were spaced about every 2 miles or so and seemed to be well-stocked with water, Gatorade, gels, and bananas. ENTERTAINMENT: RnR races are known for their entertainment and this one did not disappoint. There were bands every few miles and music playing from almost every kilo marker. I did not catch the name of the band playing at the after-party when I crossed the line but they were awesome and even after completing a Ragnar race and a marathon I found that I couldn't help but move and groove a little to the songs. All in all I think RnR did a fantastic job putting on this race and I found the people of Montreal to be incredible supportive and welcoming. Definitely worth adding to the race calendar! 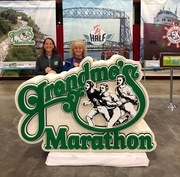 "There is a reason Grandma's Marathon is a bucket list race!" This race is fantastic. Super-well organized, fun crowd-support, a beautifully scenic course, and enough people on the course (around 6,000 marathoners) to make the atmosphere fun without feeling overwhelming. Probably the most challenging aspect of Grandma's for most runners is the logistics of getting there and staying nearby. I wound up making the 15-hour journey via car which meant that I had to build an extra day into my travel time. Also, lodging in and around Duluth is not cheap. Most hotels charge upwards of $300/night and require a two-night stay over race weekend. A friend and I wound up staying in a dorm about 3 miles from the course which was easier on the wallet but made for some extra juggling to figure out parking on race morning. Fortunately, we are both early risers and so we arrived at the transportation area for the shuttles around 4:30am and had our pick of parking spaces. I easily boarded the scenic train to the marathon start and my friend got on a 4:45am shuttle to the half start. The train was lovely. However, I will say that the bathrooms were disgusting within about 30 minutes of the trip. Train lavs don't flush very well and with that much use, they were blocked and overflowing pretty quickly. I talked with a woman who has ridden the train in year's past and she said the same thing happens every year. So if you're riding the train to enjoy the scenery then go for it; if you're riding the train to take advantage of the bathrooms, skip this "perk" and take your chances with a porta-potty instead. They are plentiful at the start line as well as along the course. Grandma's is a point-to-point race course starting in Two Harbors, Minnesota and finishing in Duluth (hence the shuttles.) The course is pretty much flatish -I live in a hilly area so this felt flat to me but there are a few gentle rollers and short but steep "hill" dubbed the Lemon Drop which is more feared than it needs to be simply because you hit it around mile 21 of the race. There is lots of crowd support and music along the course so if you feed off of the energy of the crowd, you can get your fill here. The crowds aren't huge but you are rarely alone on the course. If you prefer, you can just look to the left and soak up the view of the tall pines bordering Lake Superior. Even though it was foggy and overcast on the day of this race, I could still and smell enough of this scenery to really make me fell like I was at a destination race. After the race, you can grab your medal, t-shirt (only finishers get shirts! ), and food which this year consisted of fresh fruit, bagels, chicken broth (because it was a pretty chilly day), and snack bars. The finish line also has showers where you can get cleaned up and a rockin' party that certainly outlasted me although that wasn't really saying much! 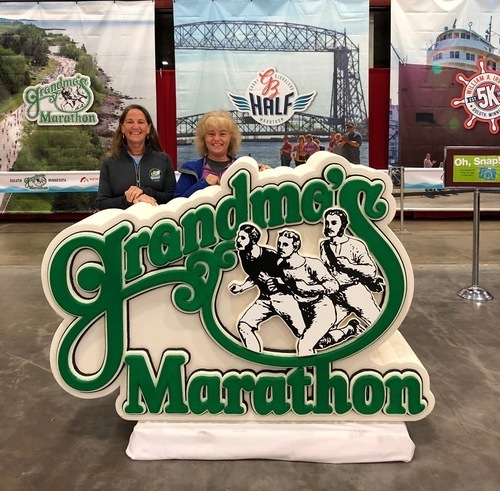 Bottom line: Grandma's is a fantastic race that is so fun and well-organized that you'll be glad you added it to your list.